While our concept of bones as load bearing structural elements stems from well-understood engineering concepts, it is important to realize that most of our engineering knowledge is geared towards solving a different set of problems than those faced by our bodies. The vast majority of structural engineering tasks are focused on constructing stationary structures that maintain a reasonably constant relationship with gravity. 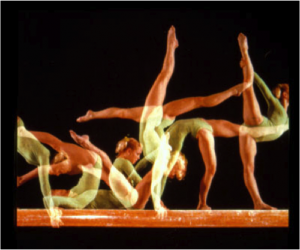 In other words, when we build houses (or even moving things like cars and most robots), we generally assume that the structure will stay still and will not perform handstands. Animals, on the other hand, must be robust to any orientation with respect towards gravity. Beyond that, we animals must be able to resist and generate forces into the world from any unexpected direction as we scramble, hunt, run, climb, dance, and play through life. In general, continuous compression structures are optimized for a single path of forces to flow through them to the ground. As long as the forces the structure will experience over its lifetime are understood, one can build support exactly where it is needed. 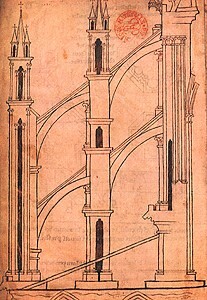 I’ve always loved the medieval cathedral’s flying buttresses as a good visual image of this. The infrastructure that has been built is great for holding the tall walls and roof of the cathedral up. But, if you pushed on the cathedral in an unexpected direction (such as sideways on the middle of the piers as indicated with the arrow below) the structure may fail because it cannot dissipate the applied force. 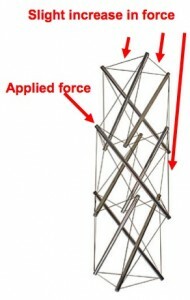 Due to their integration through the tension network, tensegrity structures are uniquely capable of globally distributing forces and are very robust to forces applied from unexpected directions. In the image below, if one pushes down on the indicated strut, the force is globally distributed through the whole structure. Thus, there is less chance of a single component failing, as all the components share in dissipating the extra force. This quality makes tensegrity structures tolerant of being reoriented in the field of gravity. While gravity is always applying force in a single direction, how the structure experiences that force is dependant on its orientation relative to the ground. Thus, when we do handstands, the force of gravity is applied to our bodies very differently than when we are standing. 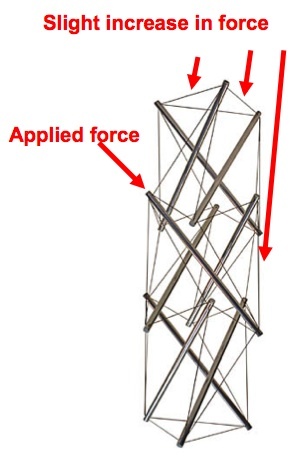 Tensegrity structures can deal with this variability in applied forces much better than continuous compression structures. Many large modern buildings that have large spans or are in earthquake prone regions incorporate concepts from tensegrity structures to take advantage of this robustness to unexpected shaking forces. But beyond that, tensegrity design has not taken over modern construction techniques despite a steady stream of enthusiasm from young architectural and art students. The major problem is that tensegrity structures are not rigid – they oscillate and vibrate as forces integrate through the tension network. Thus, to build static structures such as art sculptures and buildings that will hold still, high levels of tension need to be applied. 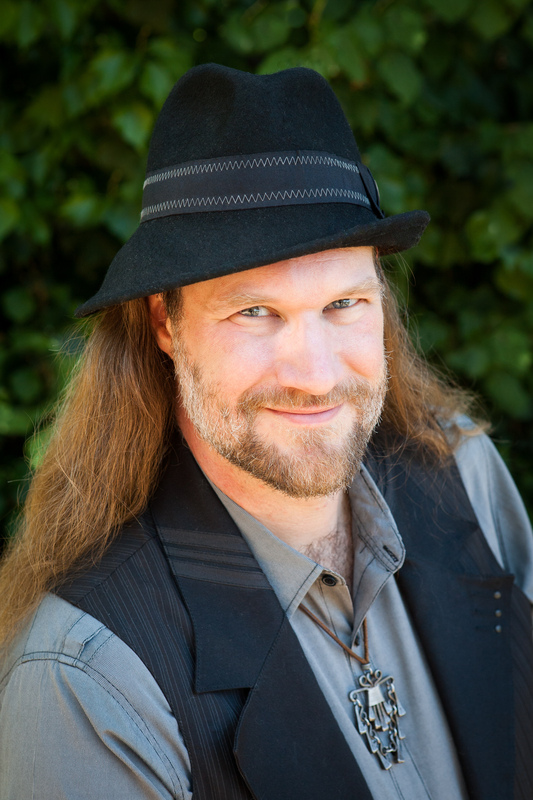 UPDATE To see some of my recent work on applying fascia centric concepts to tensegrity robotics, see my post on a robotic tensegrity snake, development of a tensegrity based planetary lander, and a video of a lecture I gave in Switzerland. Tagged with architecture, art, biotensegrity, flying buttress, motion, structure, tensegrity. 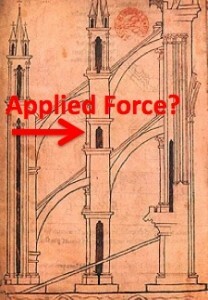 The example of engineering being mostly concerned with static forces is true, but is this example so because of record available (mainly architecture followed by mechanical examples) or because our technology is so limited yet. We now have modelling that can handle complex mixing (hydrodynamics) and modeling that can handle complex stresses, but the intellectual framework for tensigrity which would be needed for the computer modelling is not there yet. Or is it? I don’t know. Yes, there are engineering and modeling techniques to handle complex non-linear systems like tensegrity structures — they are hard, and computationally expensive, but doable. The point is that the “standard” conceptual model of human anatomy is based off of engineering concepts that are really intended for static structures. Thus, it is worth seeing how deeply the conceptual model shifts when thinking about tensegrity structures that are made for motion. The challenge is to figure out how to manage/control tensegrity structures for real-time motion. There has been some research into control of tensegrity based robots already by some pioneering researchers, and I hope to get more in depth on that work soon, along with sharing my vision for how that control should be done. It would like before everything of congratulating him for the blog, it is excellent.I am physiotherapist and work with Dysfunction of TMJ (Temporomanbular Joint). My patients always present a lot of tension in the musculature chewer and pain. Does the Doctor believe that the use excess (bruxismo) can it also produce an accumulation of collagen in these structures? I have been working my patients always using the acupuncture, mobilization fascial and breathing exercises and he/she would like to understand him/it better because of the results they be so good. Thanks! Yes — if the patient is holding their jaw clenched (i.e. statically tight) I would expect that muscle to shorten and stiffen, and thus further aggravate the problems. As you mention, fascia mobilization would seem like a good treatment. Of course, while this will help with the pain and the current tightness, the underlying cause as to why the patient is habitually clenching their jaw must still be solved. This will likely have more to do with their psychological response to stress, lifestyle, and general health.